Wild roses of many species (Oginiminaga wunj rose berries, in Ojibwe) are abundant on the western prairies, especially when water is anywhere nearby. They like sun. The ones I've seen in North and South Dakota all have pinkish blossoms, like this drawing, but I've heard there ar white, yellowish, and pale reddish-brown ones also. These roses, blossoming on thorny briar tangles, flower through June and begin to set their haws, hips or berries, which are ripe by early fall, as shown to the lower right of the drawing. Rose hips have been an important food for all Native tribes where any kind of roses can be found. They are extremely high in vitamin C, much more so than oranges, for example. Dried, they keep well, and will always be available in winter. Most health food co-ops sell them (for $25/lb or so, another economic opportunity for tribal youth in late summers). Dried rose hips need to be boiled about 10 minutes to make a tea of them; just pouring hot water over them results in a fairly tasteless brew. Use 2 tablespoons per pint of water, boil covered. The hips must expand, split, and let the water get at the soft seeds within. 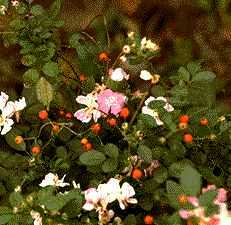 The resulting tea may be pinkish, depending on the type of roses whose berries are used. The hot tea is acid-tasting, but not as sharp as lemon juice. Some like it sweetened. A half-teaspoon of dried mint may be added to give it a different flavor. Purchased rosehips for tea you'll find only the hardened dried shell of the berry. Boil that 15 minutes for your tea. Native women didn't brew a tea and throw away the cooked berries. These were used in soups and stews. The "leftovers" cooked out in a largish batch of rose-hip tea (the berries expand a lot) are a good dinner vegetable, with butter and salt. There is still a lot of remaining food value in the cooked berries. At $25/lb who wants to throw them away? It is now known that rose hips contain biologically valuable bioflavinoids. Citrus fruits -- usually cited as the best natural source of vitamin C -- have them too, but in the bitter white under-peel that is usually not eaten. Of course, you can buy bioflavinoid pills. A curious thing -- when I was reading and researching for these plant pages, I looked at both "balanced nutritious meals, not pills" nutritionists' books and at books by the kind of dieticians who want you to swallow $100-worth of vitamin and mineral diet supplements every day. Both types give long (meals) or short (pills) food lists for foods that are good sources for various dietary requirements. Nobody mentioned rose hips. Yet they are quite popular among yuppie health co-op food buyers. By hanging around the big herb area at the neighborhood co-op I belong to and questioning people, I found that rose hips among these people are used only for tea -- no one considered eating the berries! They were quite surprised when I mentioned it could be done. Recently, I pulled the following table from the powerful AGIS ethnobotanical database of Native traditional plant food phytochemicals. It's a chemical analysis, and doesn't directly compare with USDA food nutrient analyses -- no real way to compare the parts-peer-million reported with minimum daily requirements of vitamins and minerals in a certain amount of rose hip tea or cooked rose hips. Too, I think the analysis is old. The table generator does not pull a great manu minerals and compounds that nutritionists have found are important -- and that are retrieved for other plants in this database. What the table below shows is that rosehips are extremely high in vitamin C (ascorbic acid), have some beta carotene (plant form of Vitamin A), bioflavinoids, and considerable pectin -- soluble form of fiber, which helps to prevent intestinal cancers. lowers saturated fats and triglycerides, helps to control blood pressure and good for the heart. But this table does not state the biochemical analysis in a way that is readily translatable into human nutrition. Disappointingly, it appears the fantastic phytochemicals database has been prepared more with the needs of the medical/chemical industry -- looking for new sources for salable drugs and food supplements -- in mind than of people (such as Native groups) interested in these plants for non-technical practical uses. The table below is &auot;active". Click on the chemical name for a summary of its use by the body Reffectivenesses or presumed medical uses. CREDITS: Wild rose and haws from the Colour Herbal by Nicholas Culpepper, 1649. This neat book has stayed in print over 300 years. The latest edition is a large paperback issued by Sterling Publishing of Tornonto, $17.95 (US), $24.95 (Can). Culpepper was an interesting character: an early 17th-century doctor who decided to try to serve the poor instead of getting rich doctoring the rich like others of his class were doing. He prepared his herbal to help country people, who were being forced off their land to the slums of London, so they could recognize herbs that could (in the medical thinking of his day) help them. He used common, not scientific, names to organize the plants, and color paintings to help the people identify them. His advice is nonsense, and the modern herbalist who "updates" it isn't much better in a practical sense. The plants are all British, with only an occasional one like this, the wild rose, that's similar everywhere -- but the book is beautiful and a good read. From it, I finally learned what a Mangel-Wurzel is. I'm not telling!